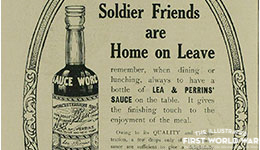 The prospect of leave kept up morale among serving soldiers, though for privates, this might be as infrequent as only once a year. Leave was allocated per unit with officers and men moving up through a rota until it was their turn for leave, usually a week long. Men who had further to travel home would often be granted additional days to account for an extended journey. Most soldiers, once issued a leave warrant, would make their way back to England to see family via Boulogne and Folkestone before catching a train that would bring them into one of the major London rail terminals.
. 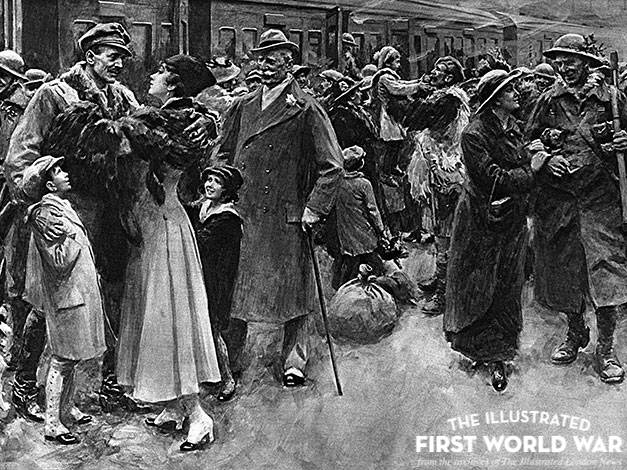 The image was a heart-warming one and appealed to illustrators such as Helen McKie in The Graphic who drew scenes at Victoria station at Christmas time, entitled, ‘A Buffet for the Buffeted.’ Others were unfamiliar with the city, but help was at hand; drivers from the YMCA’s Night Motor Transport Column would patrol the streets and pick up any disorientated men, some of them, “Colonials, who find themselves far at sea in the sleeping metropolis,” in order to ferry them to the nearest hut or hostel. Police officers or the National Guard would also act as guides when required. The joy of homecoming and of seeing family and children, conflicted with the guilt at being away from comrades at the front and the mental dislocation of suddenly being among civilians, who with a knowledge of the war derived from news reports and gossip, could not possibly comprehend the reality. Home front Britain may have endured air raids and rationing, but compared to the awful conditions at the front, many men on leave felt the population was continuing to live in relative comfort. This growing chasm of understanding between the serving solider and the naïve civilian became another common theme among magazine cartoonists, though so too were the delights of leave – a comfortable bed, a theatre trip or the admiration and attention of friends.